Early shotguns, like the blunderbuss with its trumpet like muzzle, were used for close range defense against the highwaymen and robbers along England's country roads. 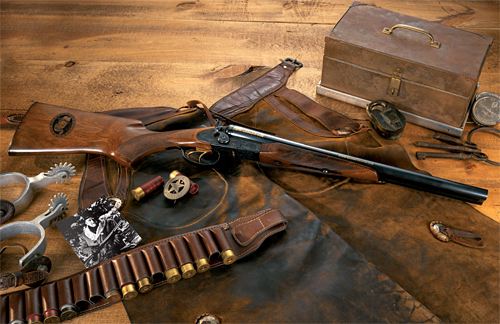 A short double barreled side by side coach gun was the primary defense of western stage coaches, and the term "riding shotgun" refers to the right hand top seat next to the driver. It has been said that the shuck chunk sound of a pump shotgun is enough to send home invaders running for the door. Don't bet your life on it. For home defense, the magazine tube can be kept loaded as long as unauthorized persons can't access the weapon itself. However, if you need it, you nay need it right away. Do not keep a live shell in the chamber of the barrel at any time, because generally the safety will not prevent accidental discharge. The 18" minimum legal barrel length is short enough to allow the shot to spread at room range with an open or cylinder bore choke. Nine to twelve double 00 buck pellets or twenty seven to thirty two number 4 buck pellets in 2 1/4" shells could serve home defense needs without over penetration. However, a quick switch to slugs should be practiced for targets over 15 feet away. Shotguns by major arms manufacturers will be supported by aftermarket accessories. Extended magazine tubes hold more shells. Special order short 12 ga shells will allow increased capacity. Pistol grip and folding stocks give increased handiness. Ghost ring rear sights combined with self luminous front sights speed acquisition and increase accuracy. Be careful if you add aftermarket items. For example, some magazine extension tubes fail to feed under adverse conditions. Even without any customization, the 12 ga pump shotgun would be the best choice for a first weapon. Youth models have shorter stocks and are more comfortable for petite shooters. The shotgun may be the easiest of all weapons to learn, but practice and weapon familiarity are still important for its effective use. Most pump actions use interchangeable barrels, and make the shotgun the most versatile firearm. The short barrel works for defense and hunting in the woods. A 26" to 28" barrel with a variety of choke tubes that screw into the muzzle works for upland game and waterfowl out to 40 yards. A rifled slug barrel can provide the accuracy and power for larger game out to 100 yards. The 20" slug barrel may come with rifle sights or with a cantilever that extends back over the receiver and acts as a scope mount. A saddle mount on the receiver is available which quickly allows the use of a low power scope or red dot sight system no matter which barrel is installed. A replacement magazine cap with a swivel stud makes adding a sling easy. A simple pump shotgun like the Remington 870 Express is much less expensive than a rifle. The indigenous peoples in the northern territories and Alaska use the 12 ga. with slugs for protection from the large bears. Strategically placed 12 ga. slugs at corners and studs can collapse a building within minutes. Safety note: Because of the thin shotgun barrel, firing it with any slight obstruction in the bore can bulge it or burst it with potentially disastrous consequences. Even a bit of snow or a light plastic wad left in the barrel from a squib or light load is enough obstruction to be dangerous. This versatile and economical Remington 870 Express has an 18 1/2" home defense barrel installed. Above, the 28" barrel accepts screw-in choke tubes. Below, the 20" rifled slug barrel is cantilevered to accept a red dot aiming device. Factory stocks, rather than aftermarket pistol grips, make the shotgun much easier to control . Shot shells are bulky, and the tubular magazine has limited capacity, but being three guns in one, it makes an excellent choice for a first survival weapon system. "One occasionally hears the suggestion that birdshot, from a shotgun, is an effective home-defense load. The argument is that is won't penetrate excessively, that it is 'effective' at close range, ad nauseam. I'm currently involved in a murder investigation that has convinced me, beyond all doubt, that the use of birdshot as a defense load is a poor idea indeed! The lethal confrontation took place in the repair shop, with the two combatants separated by less than two meters. The perpetrator opened festivities by using his shotgun to blow the lock off a locked door. It took two rounds of buckshot. The lock was demolished, and the door blown open. There was a refrigerator just inside the door, and the victim was a few feet away, on the other side. As the perpetrator advanced, the victim fired one round at him. His aim was poor, and most of the lead shot hit (and failed to penetrate) the refrigerator door. A few struck the perpetrator in the face, destroying his right eye. The startled perpetrator pulled his head back but immediately rolled back out from behind the refrigerator and fired a single shot. All nine pellets of 00 buckshot struck the victim in the center of his torso. The victim probably suffered a fatal injury, falling where he was hit. The perpetrator then walked over to the victim, who was laying on his back, and fired a second shot into his face from only a few inches. The victim's head was blown to pieces. When we found the body, he was, long since, DRT! Our perpetrator then walked out the shop, got in his truck, and drove nearly one hundred miles to the small, ranching community where he lived. Only when his eye injury was pointed out to him, as well as the fact that his shirt and trousers were soaked in blood (mostly his own), did he grudgingly concede that he might need medical attention. Hours later, we arrested him at the hospital where he sought aid. He is now on trial for murder and will most likely spend the rest of his life, with only one eye, in prison. Just another local idiot who had too much liquid courage!" Comment: When it is your intention to defend yourself successfully, particularly against evil and determined individuals, you're well advised to use a weapon and load that will end the fight quickly and decisively. And, you better be an adequate marksman too, as you'll likely not get a second chance! It's an age-old lesson that this victim learned the hard way. Unhappily, he didn't live long enough to put his new-found knowledge to work!